There’s something wrong with the money system. It’s fraudulent on its face—“money” is “loaned” into existence, which is a concept so fantastical and illusory that they have to brainwash us our entire lives to get us to accept it. They have to turn it into a game in which they literally keep score. You know, a credit score. And you have to behave, or your score will suffer. You won’t be “worthy” of credit. And so that’s got to change ASAP. Like, yesterday. But it seems impossible that it will ever change, like we’re just stuck with the fraud. Because for some reason, when I was flipping through a recent Entertainment Weekly(Game of Thrones cover) and saw the comment from Raven-Symone pictured above, I thought, “Maybe there will be a change sooner than we might have hoped.” Not sure why that came to me in the form of a Raven-Symone quote, but then again, it really has nothing to do with her. 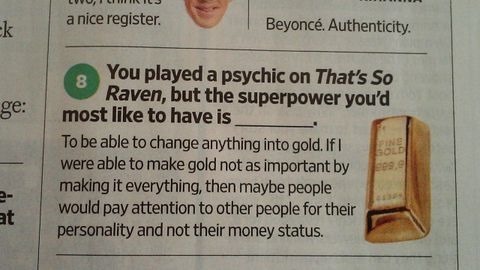 It’s that a comment about trying to have money and specifically gold play a much more benign and unimportant role in our lives and in society is mentioned in a widely-available, newsstand, low-brow publication like Entertainment Weekly. Because you know that comment was vetted by Raven-Symone’s publicist/agent/team and by the EW people. And they didn’t change it. It wasn’t deemed to be touchy or too political. That’s progress. The Pope. Nick Hanauer. Princeton University (oligarchy study). Positive Money UK. Occupy Wall Street. COMER v. Bank of Canada. David Graeber. Michael Hudson. Max Keiser. Peter Joseph. Michael Tellinger. Russell Brand. L. Randall Wray. Alex Schaefer. Alex Jones. Ellen Brown. Liberty Road Media. What should we replace our money system with? Self-issued currency, of course. Don’t scoff, we already self-issue our currency, we’re just forced to pretend that banks lend it to us. This entry was posted in "supply and demand", fiat currency, Gold, Gold standard, self-issued currency and tagged Alex Jones, Alex Schaefer, Bob Marley, COMER v. Bank of Canada, David Graeber, Ellen Brown, fiat currency, gold, Hawkwind, income inequality, King Midas, L. Randall Wray, Marshall Crenshaw, Max Keiser, Michael Hudson, Michael Tellinger, Nick Hanauer, Occupy Wall Street, Peter Joseph, Pope Francis, Positive Money, Raven-Symone, Russell Brand, self-issued currency, superpowers, Warrior on The Edge of Time, wealth. Bookmark the permalink.